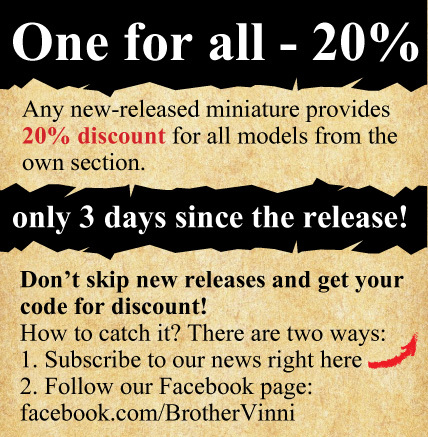 Brother-Vinni's miniatures is online store. We produce and sell original wargame miniatures and provide shipping all over the world. We sell miniatures of our own production. We can make a custom-built miniature for you. We can provide resin casting for you. We can make a high-quality or "tabletop" painting for you. We are ready to cooperate! If you have questions or suggestions - contact us please, we will advise you and will try to respond in detail to all the questions. We send parcels in the super boxes and guarantee that you will get a miniature fully intact, not broken or damaged. We guarantee that you will receive your order, in case of problems at the post office will send the parcel again at our own expense. We give gifts and special offers for our customers, join us!